1.) Where wall-to-wall carpet is being installed the way I have it laid out seems to be correct. 2.) 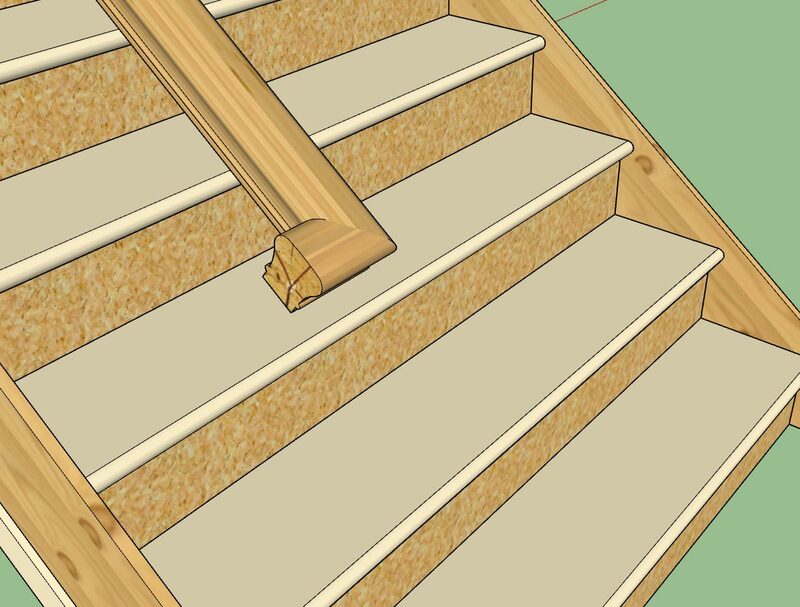 The first point you select to position the stairs is the "Finished Floor" height. 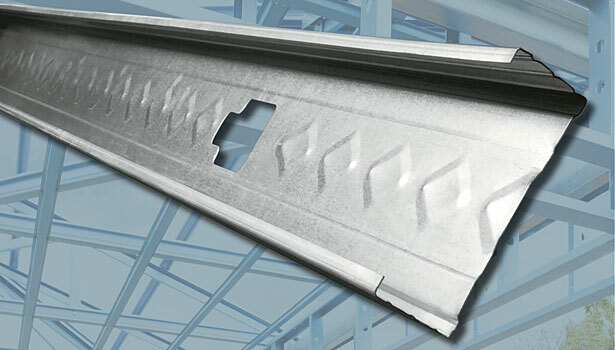 So if you need an extra 3/4" for a tile or wood flooring you would select a point that is 3/4" higher than the sub-floor. 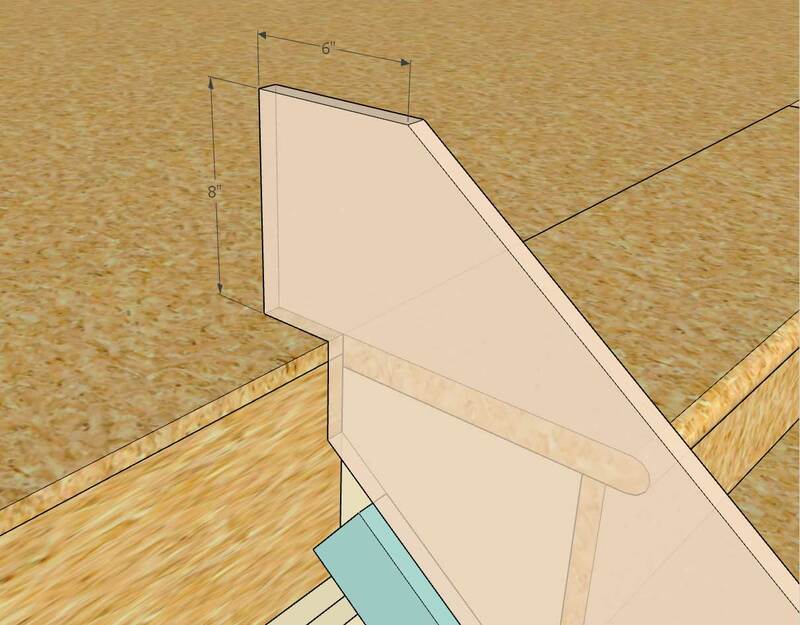 However, if the skirt boards are supposed to be installed prior to the final flooring then this would not be quite correct since they (their horizontal cut) would need drop 3/4" so that they meet the top landings subfloor. 3.) Similar sort of issue at the bottom of the stairs but slightly different. 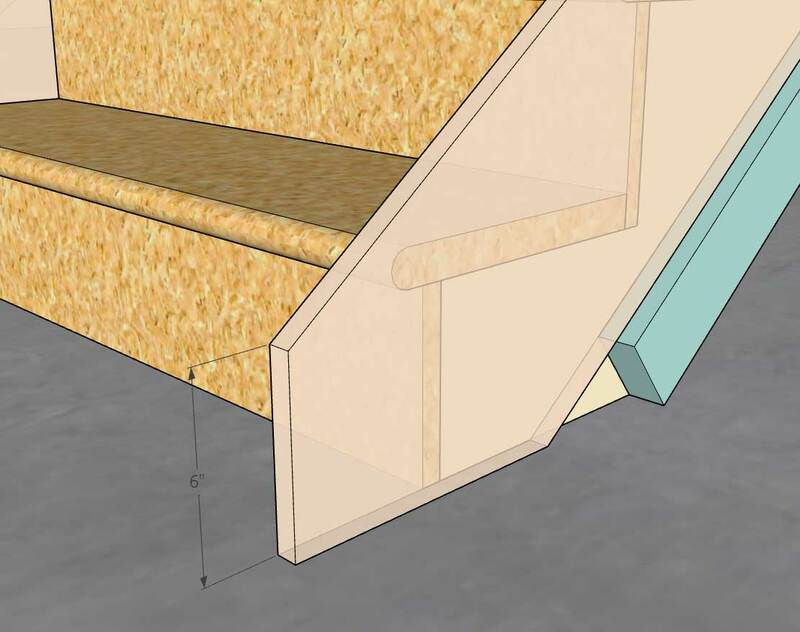 In this case the stringers will rest on the sub-floor, the bottom tread needs an extra 3/4" of rise, and the skirt boards will probably rest on the sub-floor/slab as well. 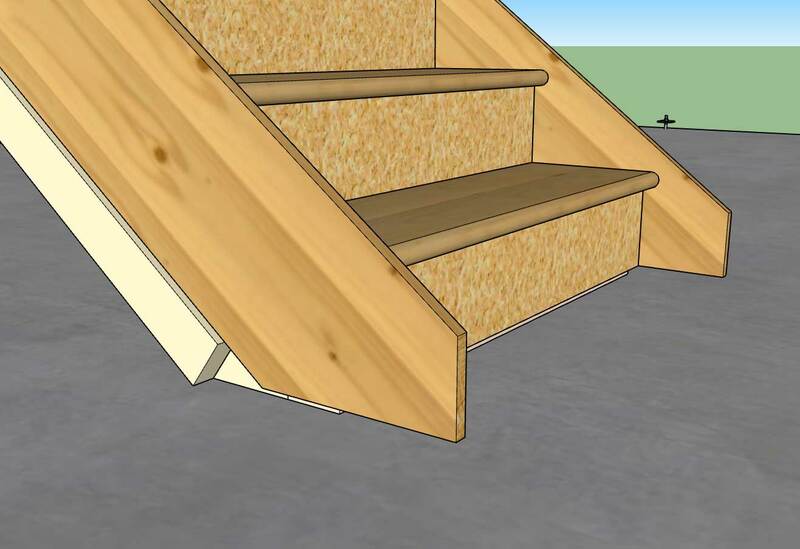 Question: Will the skirt boards always rest on the sub-floor or should they rest on the finished floor? Conclusion: I need to add two extra parameters to the module to account for an additional thickness due to finished floors being installed. Since the finished floor on each level may be a different height (or carpet) we need a separate parameter for top and bottom. 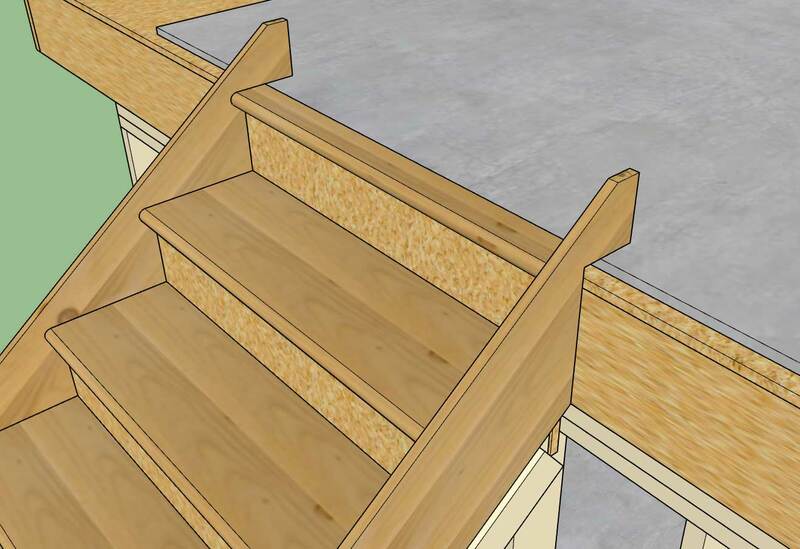 If I include a finished floor offset, the correct way to select the points for the stairs would be sub-floor to sub-floor. 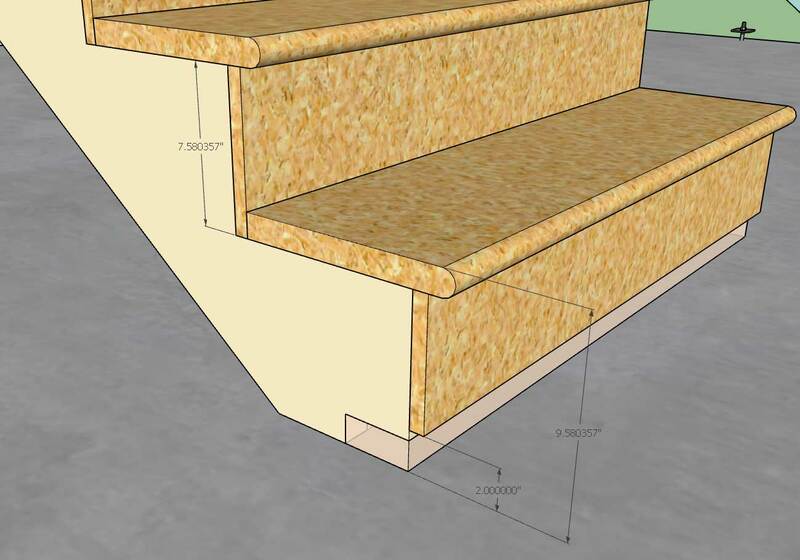 I will also need to include an offset parameter for the skirt boards since we can't be sure that the designer will want to install the skirt board directly onto the sub-floor (it might rest on the finished floor). 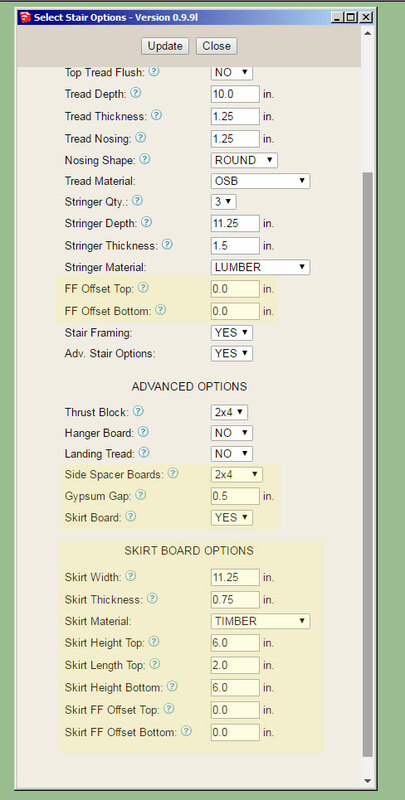 Actually these parameters should be simple YES or NO parameters (with the offset equal to the finished floor offset from the parameters above) but there may exist a situation where the skirt board may be slightly lifted off of the finish floor so they each need to have a dimension associated with them. 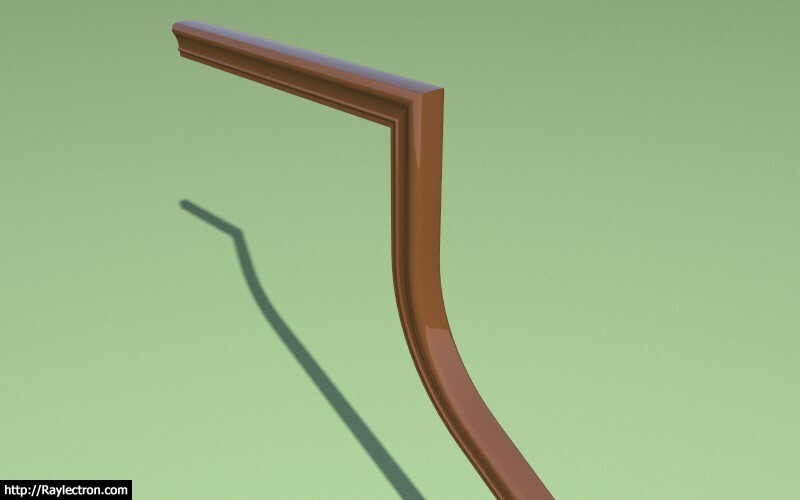 Note that the riser heights are correct and that the bottom riser has an additional 2" added to its height. The question I have is what to do with the riser board itself on this bottom tread? 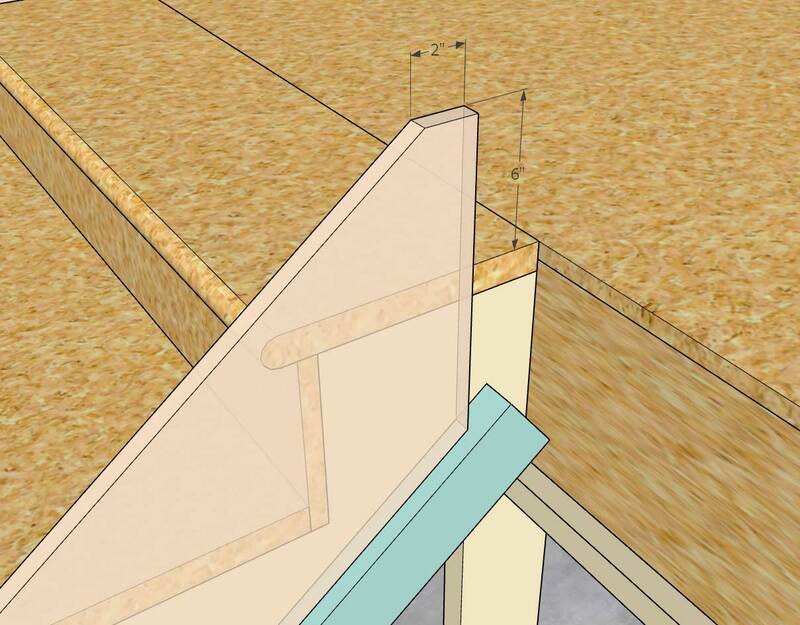 I've shown it in the configuration where the finished floor can be applied underneath the riser board however is it more common just to extend the riser board to the bottom of the stringer so that it rests on the sub-floor or slab? Note the overhang of the tread and risers, the gap is either just the gypsum gap or gypsum gap + skirt thickness. 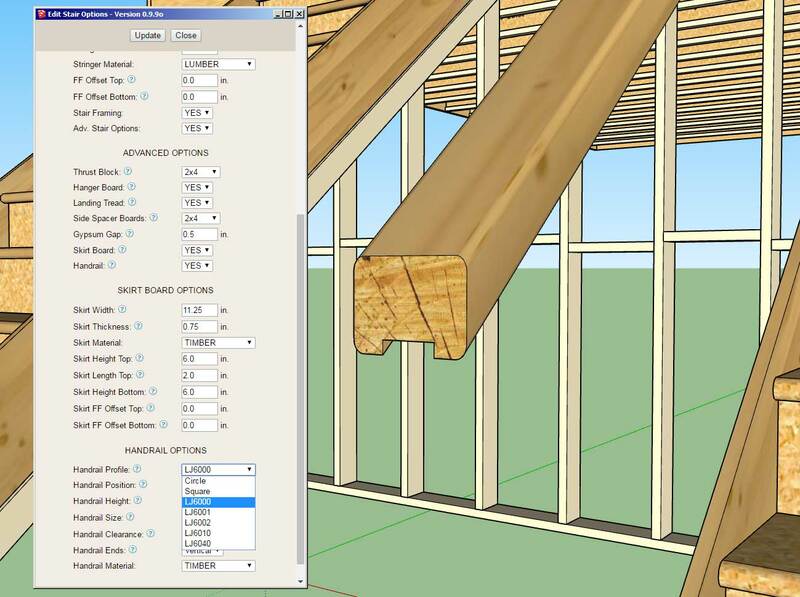 The way it is setup now, you will want to specify the top and bottom points on the sub-floor. 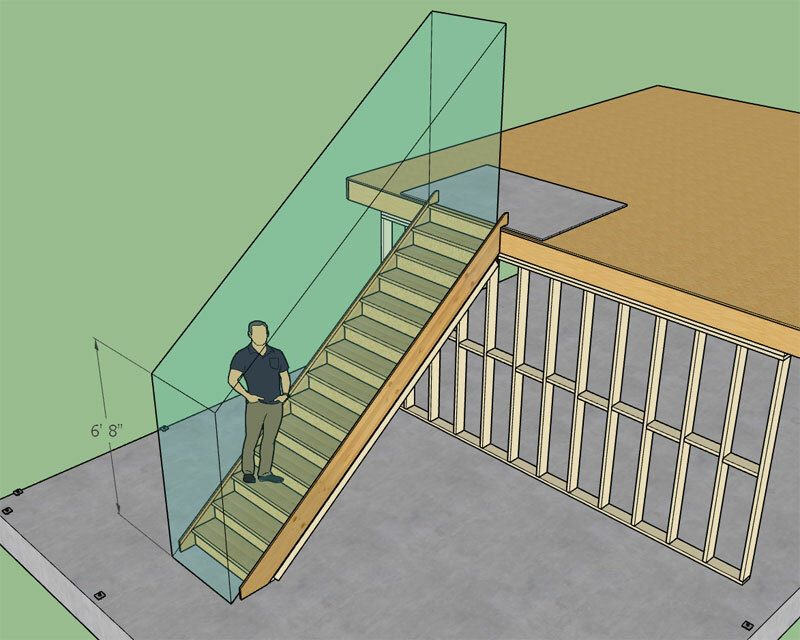 - Added the following options to the stair module: side spacers, skirt boards, finished floor offsets. 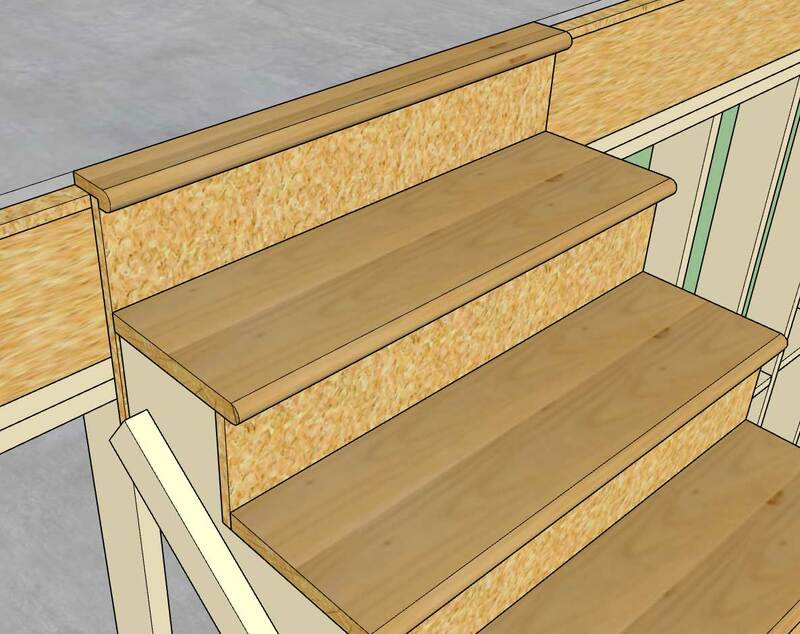 When selecting the points to define the stairs you will want to pick sub-floor to sub-floor now that the finished floor offsets are enabled. Stairs created in version 0.9.9m are not backward compatible with this latest version as I have made too many updates and improvements to the code. Keep sending in your ideas on how to make this module better. I will be moving back to work on the gable wall module and giving this one a rest for a while unless there is an unresolved bug or critical fix that needs attention. I have a separate "todo" list just for this module. 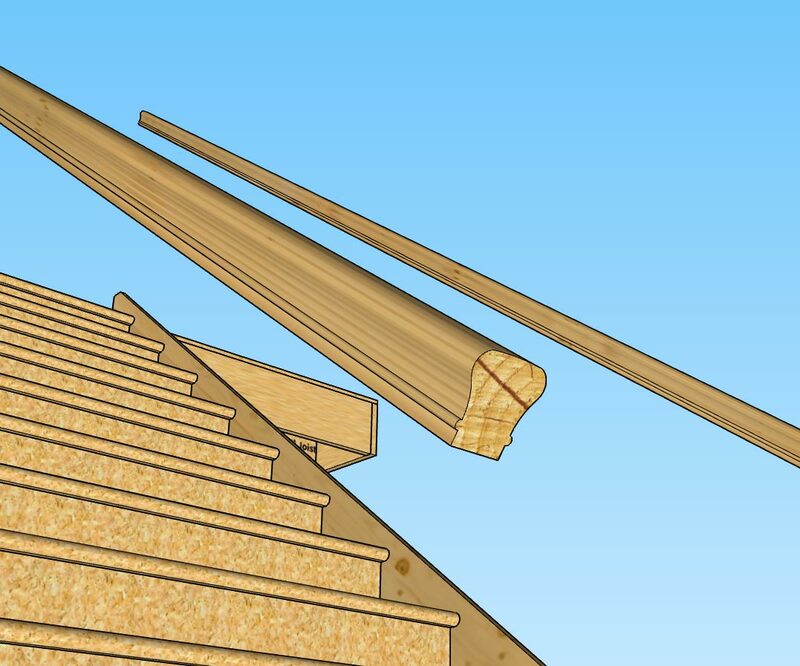 On a related note I am wondering what the best text book on stair construction is that is out there. I am not looking for traditional designs or methods per say but would like to have a practical text that covers modern methods and materials. 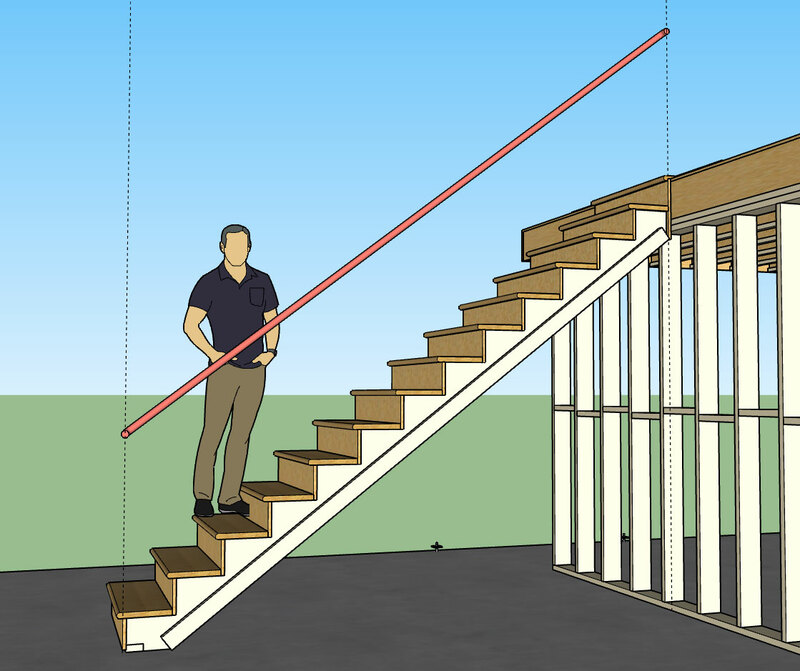 I would like the stair module to handle 80-90% of most stair designs that are utilized in your typical mid-range homes. The elaborate mansions with their spiraling and flaring staircases are probably beyond the scope of the stair module at this time. 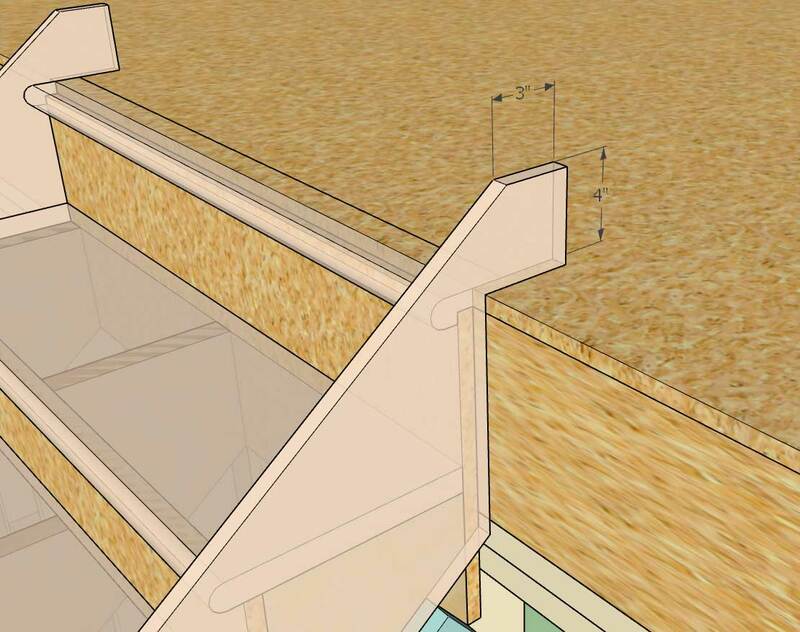 If that type of staircase is required I would strongly suggest more specialized stair plugins such as Garry Kernan's Stair Maker.